Today at CES, Lenovo announced a series of firsts for the company's very popular Yoga and Flex series of convertible laptops. Laptop shoppers will now have a wider choice in terms of size, and those of us on a budget now get more flexibility from the Flex line. I got a sneak peek at the new two-in-ones and came away quite impressed. The big news on the Yoga side is that there's a new 14-inch Yoga 3. Though the screen is bigger, it still fits inside of the 13-inch chassis thanks to shrinking bezels. 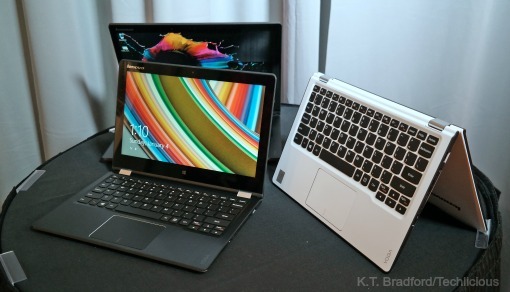 It's also quite light for the size and very thin, as a good ultrabook should be. The bigger screen isn't the only new goodie in store: you can configure this model to include discrete graphics. We can thank Nvidia for this as the GPU maker recently released a line of graphics cards with high efficiency for longer battery life and thinner notebooks, all while upping performance. Though the Yoga won't serve as a primary gaming rig, the discrete graphics enhance the power of the Intel Core i5/i7 processor and makes everything from apps to video to the web run smoother, so you can be more efficient, too. The IPS display looks great from any angle, including all the different Yoga modes (laptop, tent, stand, tablet). And the hinge moved fluidly as I switched between them. It will even lay flat at 180 degrees. Is 14 inches too big to use as a tablet? Maybe if you're trying to play a game like Temple Run. But when kicking back on the couch or playing a multi-person game like Monopoly, that size works. If you're interested in finding out how often you use each mode or get suggestions for apps that work best in the mode you're in, Lenovo has developed the Harmony software to keep track of that information and help you get the best out of each mode. Still, if you're looking for something smaller the Yoga 2 11 is still around. It's now even thinner and lighter than before--part of that attributable to the Intel Core M processor and fanless design--coming in at 2.6 pounds and 0.6 inches thick, you may not even need a laptop bag to carry this one around. When I picked it up I was surprised at how light it feels. Just like the 14-inch version the hinge is very fluid yet sturdy enough to keep the display in position. The keyboard is still well-sized and comfortable to type on. Though the display isn't IPS it still has wide viewing angles and the resolution is now full HD 1920 x 1080. Sadly, there's no discrete graphics option on this one. Both the 14 and 11-inch models have two USB 3.0 ports and a power port that doubles as a USB 2.0 port plus a 4-in-1 card reader and micro HDMI out. You have the option of a 128GB or 256GB SSD and up to 8GB of RAM. Both come in four color choices: black, silver, Clementine Orange, and new Chalk White. That last one is quite striking, though Clementine remains my favorite. The Yoga 3 11 starts at $799 and the Yoga 3 14 starts at $979 and will be available in March. If those prices are above your budget, then you should take a look at the Flex 3 line. 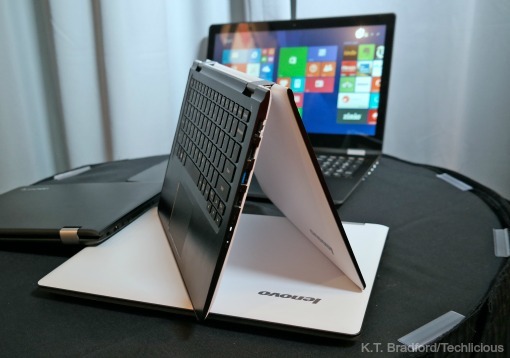 Previously, the Lenovo Flex convertibles didn't have a full 360 degree hinge, they stopped a little past 90 degrees to make tent mode possible, but not tablet mode. Now the Flex does the full 360 just like the Yoga. With prices starting at $399 for the 11.6-inch model and $549 and $579 for the 14 and 15 inchers, the Flex line fits into tight budgets better. Though not as thin or light as their Yoga cousins, the Flex models still boast a slim profile and weight commensurate to their size. And since they're thicker, buyers can get up to 1TB of internal hard drive storage. You also get full-size ports for Ethernet and HDMI. The only compromise you may notice is the lack of full HD resolution (all three top out at 1366 x 768). If 14 inches sound a bit big for tablet mode, 15 is definitely pushing it. Again, I don't see most people using it as they would an 8 or 10-inch tablet, but since the hinge goes to 180 and beyond, this size could make a great tabletop game playing platform. The Nvidia graphics option is available on this and the 14-inch model as well. Overall, the Flex 3's don't scream budget and will likely make great mainstream laptops with the added bonus of tablet functionality. They feel sturdy, look good, and now that they have a 360 hinge they're a great alternative to the more expensive Yoga 3. They'll be available in May of this year.